Description 100 Amps Alternator, 150 Amp Alternator, 20 x 9 Chrome Clad Aluminum Wheels, 2-Speed Active Electronic AutoTrac Transfer Case, 3.42 Rear Axle Ratio, 6 Rectangular Chromed Tubular Assist Steps, 6-Speaker Audio System, Auto-Dimming Inside Rear-View Mirror, Auxiliary External Transmission Oil Cooler, Bose Speaker System, Deep-Tinted Glass, Dual-Zone Automatic Climate Control, Electric Rear-Window Defogger, Enhanced Driver Alert Package, Front Frame-Mounted Black Recovery Hooks, HD Radio, Heated & Ventilated Front Bucket Seats, Heavy-Duty Rear Locking Differential, Integrated Trailer Brake Controller, Leather Wrapped Heated Steering Wheel, Leather Wrapped Steering Wheel w/Cruise Controls, Manual Tilt/Telescoping Steering Column, Power Sliding Rear Window w/Defogger, Power Windows w/Driver Express Up & Down, Preferred Equipment Group 4SA, Radio: AM/FM/GMC Infotainment & Navigation, Rear 60/40 Folding Bench Seat (Folds Up), Remote Keyless Entry, Remote Locking Tailgate, Remote Vehicle Starter System, Single Slot CD/MP3 Player, SiriusXM Satellite Radio, SLT Crew Cab Premium Plus Package, SLT eAssist Package, Soft Folding Tonneau Cover (LPO), Spray-On Pickup Box Bed Liner w/GMC Logo, Steering Wheel Audio Controls, Theft Deterrent System (Unauthorized Entry), Trailering Equipment, Ultrasonic Front & Rear Park Assist, Universal Home Remote. SLT EASSIST PACKAGE includes (L8B) 5.3L V8 eAssist engine (M5X) 8-speed automatic eAssist transmission (C5Z) 7 200 lbs. 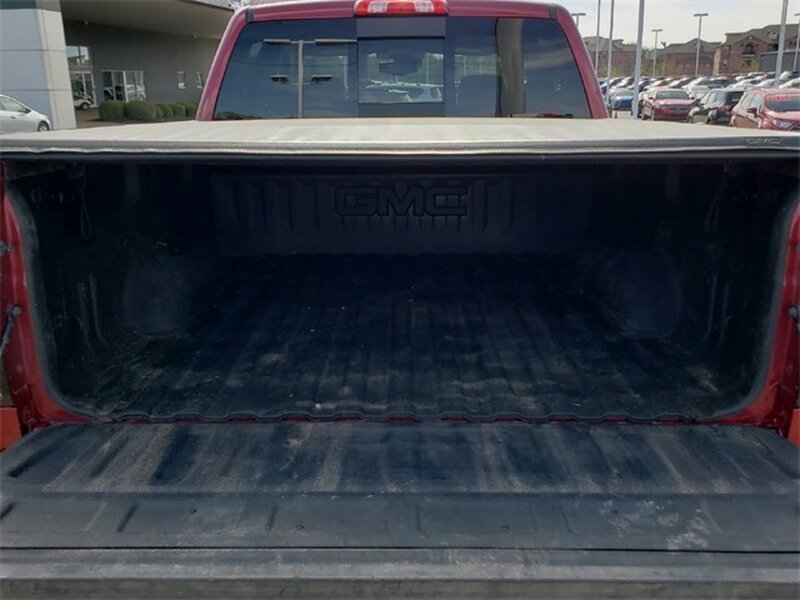 GVWR for 2WD models (C6C) 7 400 lbs. GVWR for 4WD models (UF2) LED Lighting cargo box and (5JY) soft-folding tonneau cover LPO (Includes (GU6) 3.42 rear axle ratio.